However, when all was said and done, the repaired laptop works. I am pretty sure that I broke a wire that will need to be repaired (part of the wireless etup), and I must have tweaked the LCD-to-motherboard connector because there are a series of small horizontal lines across the bottom of the screen. But they are nothing compared to the huge chunk of screen I didn't used to be able to see after I DROPPED the computer some time ago. It was actually surprisingly easy to replace the LCD, once I was brave enough to try. 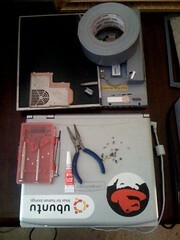 The hard part was disassembling the rest of the notebook in order to disconnect the wiring!